Miss Print: It's Giveaway Time - BasicGrey's PB&J! 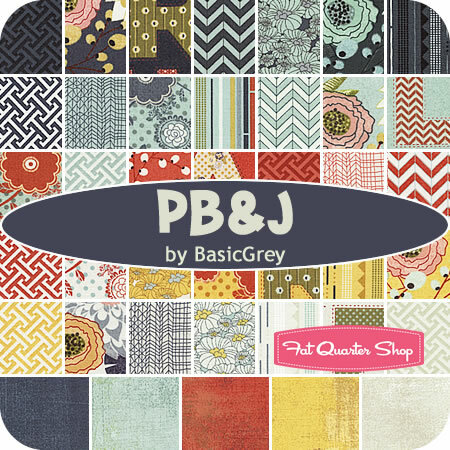 This time around we're giving away a fat quarter bundle of BasicGrey's brand new PB&J! This line is so new that only the pre-cuts are available so far (but the yardage should be available nearer the end of this month). I'm really loving the colours in this collection - very sophisticated, yet still fun, and the prints are great! I want the whole collection, but I definitely want reams of that white-ish grunge - I think it would make a fabulous background choice for a quilt I have in mind. Yep, so pretty and yummy! That's it! Two easy-peasy ways to enter! I will close the comments in a week (on March 11th) and announce the winner here on the blog. International entries are, as always, welcome! Also, please remember that I have comment moderation enabled so if you don't see your comment right away it just means that I haven't had the chance to approve it yet (duplicate comments will be deleted). my fav on the coming soon page is the 2wenty Thr3e Yardage! I must get me some of that collection! thanks for the giveaway! I liked Kate and Birdies. I really didn't see much I liked. I think the fabrics are getting too modern for me. I love the Atomic Bots line! Perfect for my three boys! I am loving Bari J. 's new line Bijou, out in May! Well, I was scrolling through all the beautiful fabrics, and then I saw "Modern Baby Quilt Book" by That Patchwork Place - and I'm smitten! Gotta have it!! Oh, and? I'm a follower! And of course I'm a follower!! Thanks for the chance to win this beautiful fabric - I hadn't seen it before, and now I have a whole new "gotta have"! I am always a sucker for Moda's Christmas lines... seem to buy a couple of charm packs every year. So, I guess I'll say I am most looking forward to Aspen Frost. Paint Box is really pretty! I like the Sea Glass Mini Tonga Treat Timeless Treasures Fabrics. Every time I look at that Coming Soon page I find something else that I simply MUST add to my wish list. Dangerous for the budget! Today I found this new love: Anything Goes Basics by Barbara Jones of Quilt Soup for Henry Glass Fabrics. I would love the Snazzy Anything Goes Basics Fat Quarter Bundle. these fabrics would be great in a quilt I am planning for my youngest daughter! I love 30's Playtime - especially the pre-cuts! Enchant sure looks cute - I hadn't seen that one before! Thanks for the chance to win! I am a follower of you wonderful blog! I love Twenty-three from Cosmo Cricket. They're one of my favorite designers. I'm a follower! Thanks for the give away. I really like the Barnegat Bay FQ Bundle. I'm excited about Katy Jones' new book. For some reason I thought I already was follower, but now it is official. I'm intrigued by the new honeycomb precuts... Asbury Heights... Boho... Growing Up Modern looks interesting... deinately Hooty Hoot returns for my Owl crazy daughter... I could go on and on! Thanks for the chance to win. Love the Deco Design Studio FQ Bundle and about twenty others! I LOVE the Winter's Lane collection - a FQ Bundle would be awesome to own. Baby Jane has some nice prints that I am looking forward to, Thanks for a great giveaway. Glimma is one I will have to look at. I can't wait to get some 2wenty Thr3e Yardage to go with the charm packs! I love love 30's playtime, Chloe's closet! The Basic Greys fat quarter bundle is neato! ....and yes, I am a follower of your blog. And I love it! I'm excited for Glimma to come in! The "Anything Goes Basics" look like fun fabrics! Wow. I could EASILY say the PB&J because it is awesome, and I would go crazy to win that. But I wanted to be all official, so I scanned The Whole List and found some great stuff, including: Bijoux, Angela's Blogger Bundle, Enchant, Glimma, Honeycrisp, Indian Summer, The Boo Crew, Thesaurus, and -- I can't read my writing, but I think it says Wickerweaves. Thanks!! I'm a follower through my Reader and I love your blog -- thanks!! I really like so many but "Spa Retreat Batiks" looks wonderful and so does "Crayon Box"
Gosh - I want it all LOL! I am especially looking forward to the Honeycombs in any fabric at all! And I follow your blog on my Google Reader! I was having a problem getting this other post to go thru so if this is a duplicate please just delete it. I am a follower of yours and wanted to thank you for your string block coaster pattern. I made them for all the ladies at our retreat and they just loved them...thanks so much for sharing. I love 30's repros and have been wanting to make a hexagon quilt, so I so want a couple of honeycomb packs in the 30's playtime! I love the new cosmo cricket line! My favorite coming soon fabric is "Happy Go Lucky"!! 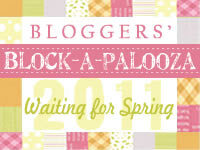 I am looking eagerly towards both Lotta Jansdotter's Glimma and the April blogger's choice bundle. Both so so gorgeous! 2wenty thr3e is my favorite-not sure I spelled it right! I like the Boho Fat Quarter Bundle Urban chiks for Moda, but there are many, many great fabrics coming up. i sure am a follower. Thanks for the give away chance. I am excited about Glimma, Shades of Black, and Simply Style - so much fabric goodness on the way, it was hard to narrow it down to even three! I am really liking Winter's Lane - love the colour combo. Looks like it would make a really pretty HST quilt. Hi I love the look of the Kate & Birdie Fat Quarter Bundle Winter's Lane Collection . My favorite is a hard choice; it’s a toss up between PB&J, Little Things Organic, and Urban Mod to use for a quilt I’m making my sister. They’d all work, and the decision is so difficult! Pick one? I'm crushing on so many, but tonight Calliope has taken the lead. This is likely to change within the hour. Angels Among Us by Buggy Barn, looks delicious! I'm a follower through Google Reader and (as of tonight) Facebook. My favorite is the Remember fat quarter bundle! I think Glimma looks great. All her collections have been prints I've wanted. Thanks for the giveaway. Thanks for the giveaway. I follow in my google reader. I could really use some of the Historical Blenders in any way shape or form. Definitely Lotta Jansdotter's Glimma. Thanks for the giveaway! I am a follower. Thanks for another chance! I love the Atomic Bots collection! I have two boys so always looking for great fabric for them! I like the 30s fabrics. Wow, challenge accepted! Atomic Bots, Ashbury Heights, Bijou, Creama nd Sugar, ENCHANT, Glimma, Gracie Girl, Happy Go Lucky, Ho Ho Ho Let it Snow, Hot Chocolate, Love and Joy, Madhuri, Mellow Yellow, Norwegian Woods, WOrld Tour----So much to look forward too! I like the Calliope Stitch Studios for Riley Blake Designs, thank you so much! 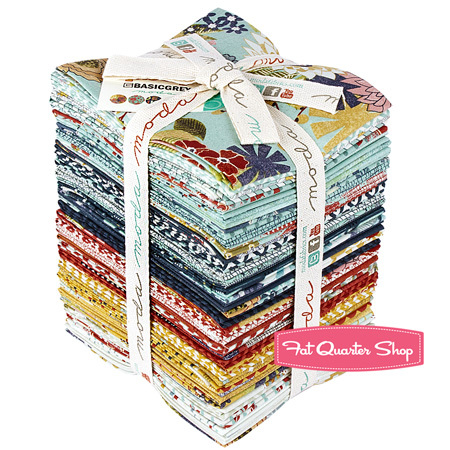 Jet Setter Fat Quarter Bundle by Faye Burgos for Marcus Brothers Fabrics is my favorite. Love the small prints in the 30's Playtime Fat Quarter Bundle! I'm a follower! Thanks for the chance to win!! Joy Batiks, Sew Red book, and A Quilting Life book. so many new things to love. I am so excited for A Gingerbread House. It looks perfect for my holiday projects this year! This is tough... I am very excited about Glimma and there are some prints in Ride that I love. The Esprit de Noel FQ bundle by French General - that is a gorgeous collection of fabrics! Yummy fabric! Another yummy fabric collection is my coming soon favorite: Happy-go-lucky by Bonnie & Camille! Honeycomb 30's Playtime would be super fun! I'm really excited about the comma F8 bundle! What an amazing giveaway! I LOVE BG's new collection! Besides that, I'm most looking forward to Urban Chiks' Boho. I am most looking forward to Baby Jane by E&J Comstock! Baby Jane by Eric and Julie Comstock seems a very pretty collection. Thanks for the chance! I am looking forward to Avalon by Fig Trees. I love the look of the Tea Room Fabric by Michael Miller. However, I totally love Natalie Lymer's fabrics and patterns so Enchant by Cinderberry Stitches is my absolute favourite. I love it!!! I like the range Bumper 2 Bumper - my boys will love that one! So many fun fabrics! I think I'm most excited for Baby Jane. I'm pretty sure I love everything the Comstocks design! Thanks! Looking forward to Fashion Plate by Barbara Jones/Quilt Soup! Very girly. Thanks for the chance! I follow you on Facebook. Many thanks for the chance! I can't wait for Happy Go Lucky and Gracie Girl. I've been looking forward to seeing PB&J and also Remember from Carina Gardner. What a great giveaway! I love the graphic prints in this line. What I'm most looking forward to is Ashbury Heights. And I follow your blog - thanks for the great content. 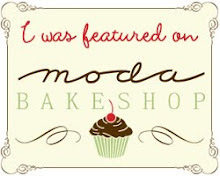 I'm looking forward to Bake Sale by Lori Holt - yummy! I am looking forward to that Twenty Three collection with all of the cameras and tickets. I have been a follower for a while now - love the blog! Oh man...I love the grunge prints....I have been starting a collection! Another bundle I am looking forward to is Boho by Urban chicks. this bundle would make a great quilt for someone on my quilt recipient list. my favorite new line is Happy Go Lucky.. and Comma. thank you for a chance to win and I am a follower. I really like Boho and also like Flats. I'm looking forward to seeing Anne Kelle's "Jingle"
My favorite coming soon is Aspen Frost. I am a follower through google reader too! Holiday Dreams by Deb Grogan for RJR Fabric is my favorite coming soon fabric at the Fatquarter Shop. oh my gosh. oh my gosh! I'm glad I checked out coming soon page. 30s playtime is exactly what I want! I love 30s fabrics. I love the 30's playtime! I wish it was out now! So Many Beautiful Things! I Love the "Holiday Frost" Collection! "Precius" from Another Point of View-Windham is my favorite. I love "bijoux" by Bari J., this bundle is full of pretty fabric! Im hoping Avalon will find its way to my door. I follow your blog, I finally set up Google Reader and it is great! Looking forward to Simply Style. Thanks for the chance. C&T Publishing, Camille Roskelley I so so so want this book. I follow your blog with google reader! I love this line.